Our NEW! range of handmade raspberry marshmallows are expertly crafted using only the very best ingredients. Many hours have been spent perfecting each individual flavour to ensure a really special experience with each bite. 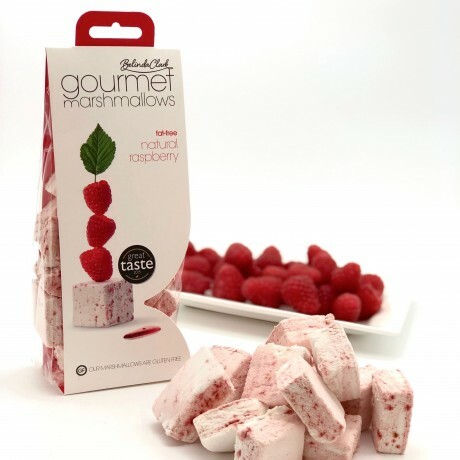 These marshmallows are incredibly light and bursting full of delicious raspberry flavour. They are handmade in small batches using the finest fruit powders and essential oils. Perfect as a treat with your coffee - or as a unique gift for a friend. Free Shipping for orders £16 or more on Belinda Clark marshmallow bags. See our other listings for the range of delicious flavours available. Sugar, invert sugar syrup, water, raspberries (3.7%), gelatine, cornstarch. May contain traces of nuts and cocoa.